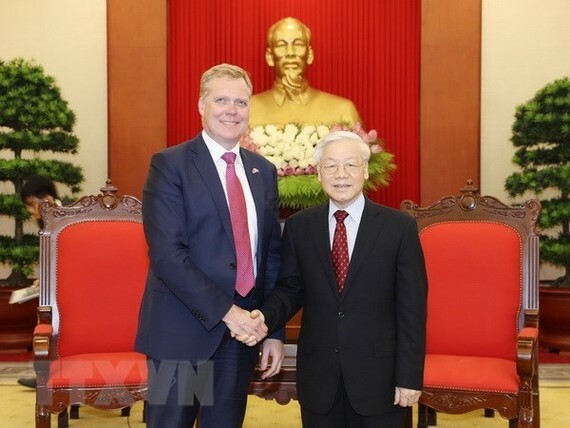 Vietnam always attaches importance to the friendship and strategic partnership with Australia, Nguyen Phu Trong, General Secretary of the Communist Party of Vietnam (CPV) Central Committee, told visiting Speaker of the Australian House of Representatives Tony Smith. During their meeting in Hanoi on July 23, the Party leader welcomed Smith’s official visit to Vietnam at a time when the two countries have agreed to lift their relationship to the status of strategic partnership. Party General Secretary Trong noted with pleasure the fruitful development of their bilateral ties across many fields, ranging from politics to economy, national defence and security to education and training. He thanked the Australian Government for their backing in Vietnam’s bid to run for a non-permanent seat at the UN Security Council for 2020-2021, as well as Australia’s coordination and support for Vietnam’s role in the Association of Southeast Asian Nations (ASEAN) and the region. Vietnam highly values Australia’s consistent stance on the East Sea issue, he said, urging the two sides to continue their close cooperation at multilateral forums, for peace, stability, cooperation, and development in Southeast Asia and the East Sea. For his part, Smith expressed his positive impressions of the thriving relations between Vietnam and Australia over recent years, especially the two countries’ efforts to elevate their relationship to the strategic partnership. The guest said he is impressed by Vietnam’s achievements, noting his belief that the legislative cooperation and people-to-people exchange between Vietnam and Australia are solid evidence of the development of their bilateral ties. Smith also voiced his hope that his trip, as well as other recent high-level visits to Vietnam by Australian leaders, would help promote the strategic partnership in the time ahead. He affirmed that Australia’s consistent stance on the East Sea issue is clear and matches the stance and viewpoint of Vietnam.